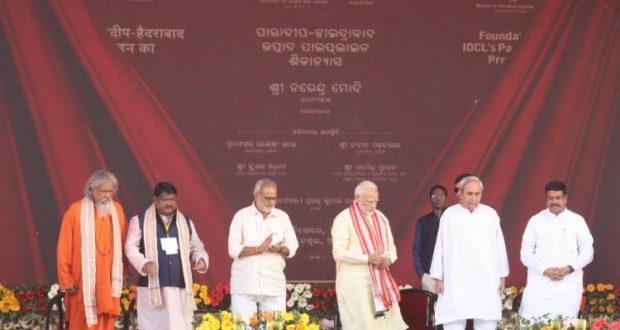 Bhubaneswar: Prime Minister Narendra Modi today laid the foundation stone of Paradip-Hyderabad Pipeline Project of South Eastern Region Pipelines, Indian Oil Corporation Ltd., at Khajuria village, before Jankia toll gate in Khurda through video conferencing from IIT, Bhubaneswar Campus, Argul. The proposed Paradip-Hyderabad pipeline with a capacity of 4.5 MMTPA provides connectivity to a new grass root depots at Berhampur in Odisha, Achchutapuram (near Vizag) in AP and Malkapuram, Hyderabad in Telangana, and also to Indian Oil’s existing depots at Vizag, Rajahmundry, and Vijayawada in Andhra Pradesh. “People of Odisha are extremely grateful to Hon’ble PM for bringing in huge investments in Odisha and neighboring states. We at Indian Oil are also committed in giving back to the society and contribute in transforming the rural landscape close to pipeline ROW, as part of CSR activities, from the profit generated out of pipeline laying,” Choubey added. The ground breaking ceremony also witnessed a series of activities for the upliftment of the villagers and connecting them to the mainstream.